The ventilatory threshold (VT) is an important physiological marker of the exercise intensity at which an individual can sustain performance for a prolonged period, and therefore is an important determinant of aerobic exercise performance capacity. Determination of the exercise training intensity equivalent to the VT is an important measure for both elite athletes and sedentary individuals. Training at the intensity equivalent to the individual’s VT provides an optimal overload stimulus to achieve both performance and health-fitness benefits. Identification of the VT in the laboratory setting requires experienced personnel and expensive laboratory equipment. Therefore, a surrogate measure of the VT is needed to guide exercise training intensity. This can be achieved by identifying a target HR associated with the VT (HR-VT). However, exercise HR can be affected by both environmental and clinical conditions and requires skill for accurate palpation when a HR monitoring device is unavailable. RPE has been validated for the prescription and regulation of exercise in a variety of settings and subject populations. Owing to its ease of use and cost-efficiency, a target RPE associated with the VT (RPE-VT) presents a practical method for prescribing exercise at VT intensity. 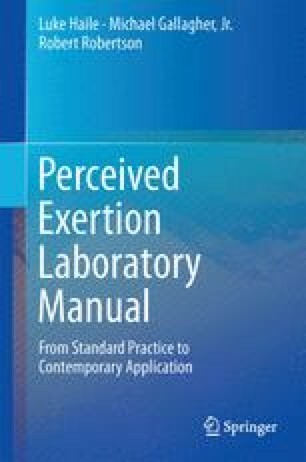 The primary purpose of this laboratory experiment is to determine RPE-VT, using both the Borg and OMNI Scales, and HR-VT during load-incremented aerobic exercise.